Jack Bell Gallery is pleased to present an exhibition of sculpture by contemporary artist Gonçalo Mabunda. For his third solo show with the gallery, the artist draws on the collective memory of his country, Mozambique, which has only recently emerged from a long and terrible civil war. He works with arms recovered in 1992 at the end of the sixteen-year conflict that divided the region. In his sculpture, he gives anthropomorphic forms to AK47s, rocket launchers, pistols and other objects of destruction. While the masks could be said to draw on a local history of traditional African art, Mabunda’s work takes on a striking Modernist edge akin to imagery by Braque and Picasso. The deactivated weapons of war carry strong political connotations, yet the beautiful objects he creates also convey a positive reflection on the transformative power of art and the resilience and creativity of African civilian societies. Mabunda is most well known for his thrones. According to the artist, the thrones function as attributes of power, tribal symbols and traditional pieces of ethnic African art. They are without a doubt an ironic way of commenting on his childhood experience of violence and absurdity and the civil war in Mozambique that isolated his country for a long period. Mabunda was born in 1975, in Maputo, Mozambique. Having trained in Mozambique and South Africa, he has been working full time as an artist since 1997. 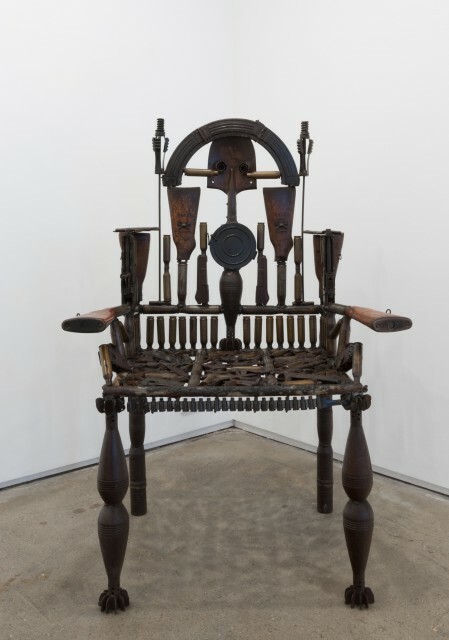 A throne has recently been included in ‘All the World’s Futures’, curated by Okwui Enwezor, at the 2015 Venice Biennale. His work has also been exhibited at Museum Kunst Palast, Dusseldorf, Hayward Gallery, London, Centre Pompidou, Paris, Mori Art Museum, Tokyo, Brooklyn Museum and the Museum of Art and Design, New York, among others.